I think this story would be fun to film. In Acts 3 there was a crippled man at the Beautiful Gate. 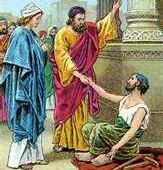 He asked Peter and John for money. Rather than give him what he asked for they healed him. This led to Peter preaching to the crowd, many believing in Jesus and an uproar that brought the three men before the ruling council, including the High Priest. All the crippled man asked for was a few coins. I’m sure even if he'd known he'd be healed that day, he could never have imagined what happened next. Be careful what you ask for with God--you just might get something better. God loves to answer our prayers, but rarely does He respond the way we want, or the way we think He will. No matter what the answer ends up to be, I can just about guarantee it will not look like what we expect. I can dream up a hundred different ways any given situation will play out. It ALWAYS plays out the hundred and first way, the one I hadn’t considered. God loves surprising us as much as He loves answering us. Picture it with me: The music builds, sunlight streams into the synagogue from above… can't you see the look on the formerly crippled man’s face the next time he heard Psalm 40?